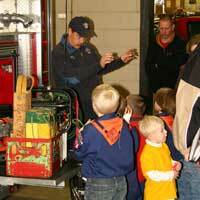 The Fenton Fire Protection District provides services other than just emergency responses. The Fenton Fire Protection District offers community CPR classes, fire station tours, child safety seat installation, and Community Emergency Response Team training to our residents and citizens. Every May, the Fenton Fire Protection District invites our citizens to visit our stations and learn about our activities at an open house to recognize National Emergency Medical Services Week. The Fenton Fire Protection District is dedicated to keeping you and your family as safe as can be. Your firefighters want you to learn about protecting kids from injury in crashes. The Fenton Fire Protection District is proud to be a child safety seat inspection station. Missouri's Child Restraint Law (RSMo 307.179) provides minimum standards for protection of children traveling in vehicles. Children ages 4 through 7 who weigh at least 40 pounds must be in an appropriate child safety seat or booster seat unless they are 80 pounds or 4'9" tall. Children 8 and over or weighing at least 80 pounds or at least 4’9” tall are required to be secured by a safety belt or buckled into an appropriate booster seat. The Missouri Department of Transportation has developed an excellent guide to demonstrate these standards. Additionally, the "Sit Tight" brochure has additional information about how to effectively use child safety seats. The firefighters and paramedics of Fenton Fire District are proud of the job we do and the equipment we use to serve our residents and citizens. We are happy to show visitors around the fire stations and show the equipment we use. Feel free to stop in and we'll show you around when time allows for it. If there will be a group coming to see the fire stations, please contact us ahead of time at 636-343-4188 and ask to schedule a tour. The Fenton Fire Protection District offers a community-based CPR program free to our residents. The American Heart Association's "Friends and Family" CPR program teaches the basics of this lifesaving procedure to the general public. Participants will learn how to recognize and manage cardiac arrest, respiratory arrest, choking, stroke, heart attack, and minor first aid. Fenton firefighters and paramedics are proud to assist the Boy Scout troops in our area by helping the scouts receive their "red cards" that document their CPR and first aid classes. These cards are required for the scouts before they may attend their summer camps. To schedule a CPR class, please call 636-343-4188 and dial extension 163 to leave a message for the CPR coordinator.